← Enriching International Rugby League Part 2 – Fix the quagmire that is international eligibility! Enriching International Rugby League Part 3 – Getting it done! This is part 3 of a 3 part series primarily focussing on those steps required for Rugby League to dominate internationally. The thoughts are an extrapolation of those first ventilated earlier this year in a previous blog. Part 1 covered the importance of the Rugby League International Federation and pumped for a greater role for the RLIF as a necessity for continuing the gradual improvement seen in International Rugby League. Part 2 covered international eligibility and particularly how continuing to adjust State of Origin eligibility criteria will build on recent improvements seen in the international game. The most important step in the recovery of International Rugby League (by far) is a workable international programme. There needs to be a heavy increase in international competition, particularly in non-World Cup years. The allure of State of Origin has been spoken about for a long time now, the financial benefits, the publicity, the excitement, the crowds and the belief that it is the pinnacle of Rugby League in some quarters. The allure of State of Origin for an NRL player is even stronger if a player’s country of birth is not Australia and his country of birth only plays once a year. David Mead (Papua New Guinea), Kevin Gordon (Phillipines), Jamal Idris (Nigeria, not that they currently have a team but I think Jamal would look good in green), James McManus (Scotland), Paul Vaughan (Italy), Tariq Sims (Fiji), Daniel Tupou (Tonga), Will Hopoate (Tonga), Dylan Walker (England via the Pitcairn Islands), Jorge Taufua (Tonga/Samoa), Andrew Fifita (Tonga) and Tony Williams (Tonga). It is important to note that the list would be much longer if we started discussing those who have made themselves available for the U20 SOO side (including Anthony Milford (Samoa)) and the Queensland SOO side (James Segeyaro (Papua New Guinea)) or those who have already committed to Australia like James Tamou (New Zealand), Josh Papalii (New Zealand), Akuila Uate (Fiji), Jarryd Hayne (Fiji), Ben Te’o (Samoa/New Zealand) and Michael Jennings (Tonga). Waqa Blake (Penrith Panthers), Peni Botiki (Cutters), Jason Bukuya (New Zealand Warriors), Regan Cambell-Gillard (Penrith Panthers), Kane Evans (Sydney Roosters), Aaron Groom (Asquith), Marika Koroibete (Wests Tigers), Eto Nabuli (Penrith Panthers), Kevin Naiqama (Penrith Panthers), Taqele Naiyaravoro (Wests Tigers), Semi Radradra (Parramatta Eels), Vitale Jr Roqica (Cronulla Sharks), Osea Sadrau (Fiji) Ashton Sims (c) (North Queensland Cowboys), Korbin Sims (Newcastle Knights), James Storer (Illawarra), Alipate Tani (Cutters), Atunaisa Turagaiviu (Fiji) and Lote Tuqiri (South Sydney Rabbitohs). Leeson Ah Mau (St George Illawarra Dragons), Fa’amanu Brown (Cronulla Sharks), David Fa’alogo (Newcastle Knights), Krisnan Inu (Canterbury-Bankstown Bulldogs), Ricky Leutele (Cronulla Sharks), Isaac Liu (Sydney Roosters), Dunamis Lui (Manly Sea Eagles), Reni Maitua (Canterbury-Bankstown Bulldogs), Penani Manumaleali’i (Cronulla Sharks), Suaia Matagi (New Zealand Warriors), David Nofoaluma (Wests Tigers), Junior Paulo (Parramatta Eels), Dominique Peyroux (New Zealand Warriors), Jesse Sene-Lefao (Manly Sea Eagles), Tim Simona (Wests Tigers), Michael Sio (New Zealand Warriors), Kyle Stanley (St George Illawarra Dragons), Sam Tagataese (Cronulla Sharks) and Daniel Vidot (Brisbane Broncos). Not only are Pacific bragging rights on the line but a chance to play in the end of season Four Nations along with Australia, England and New Zealand. That is a powerful incentive. To really increase international competition (in an already crowded calendar) the NRL must overhaul the representative calendar and make players available for representative windows. If the English Premier League can stop its 38 week season for numerous international breaks then the NRL should be able to do it for at least four weekends a year. Coordinating with Superleague to organise this should be the most important thing the NRL does. A stand-alone representative weekend four weekends a year would be a good start. International windows could be determined by the RLIF in consultation with the NRL and Superleague. For instance, the four international windows could be Anzac day weekend and the weekend before each State of Origin. Each NRL team could be given a bye during the four weekends with only 24 rounds necessary prior to finals football. This would prevent NRL rounds occurring with heavily depleted club sides because of representative duties. The Pacific Cup could then become an annual event and could be played across these four weekends. It could be run as two seeded pools from Tonga, Samoa, Fiji, PNG, Cook Islands and South Africa playing round robin with promotion/relegation depending on results each year. The winner of the top pool would get an invitation to the Four Nations each time it is played in the Southern Hemisphere. The advantage of international windows determined by the RLIF (in consultation with the NRL and Superleague) would be that the Northern Hemisphere could also conduct internationals with the availability of Superleague and NRL players (prepare for jetlag Sam Tomkins, Gareth Widdop and the 23 Burgess brothers who aren’t going to Rugby Union). Likewise, Superleague players who qualified for Pacific nations could be selected as well. Kevin Locke (Northcote Tigers), Manu Vatuvei (Otara/Otahuhu), Steve Matai (Bay Roskill/Ponsonby/Richmond), Junior Sa’u (Logan Brothers), Antonio Winterstein (Logan Brothers), Kieran Foran (Ellerslie Eagles), Shaun Johnson (Hibiscus Coast Raiders), Jesse Bromwich (Manurewa Marlins), Thomas Leuluai (Otahuhu/Ellerslie), Sam Moa (Mangere East Hawks), Greg Eastwood (Manurewa Marlins), Alex Glenn (Northcote Tigers) and Jason Taumalolo (Otahuhu/Papakura). Interchange – Frank Paul Nu’uausala (Mangere East/Otahuhu), Sam Kasiano (Otahuhu Leopards), Bronson Harrison (Five Dock/Leichardt) and Zeb Taia (Enfield/St Clair). Josh Hoffman (Mackay, Australia), Roger Tuivasa-Sheck (Apia, Samoa), Shaun Kenny-Dowall (Brisbane, Australia), Dean Whare (Rotorua, NZ), Jason Nightingale (Sydney, Australia), Kyle Stanley (Sydney, Australia), Isaac John (Tokoroa, NZ), Ben Matulino (Wellington, NZ), Isaac Luke (Hawera, NZ), Jared Waerea-Hargreaves (Rotorua, NZ), Simon Mannering (Napier, NZ), Frank Pritchard (Sydney, Australia) and Jeremy Smith (Christchurch, NZ). Interchange – Sam Rapira (Hamilton, NZ), Kevin Proctor (Te Kuiti, NZ), Sam McKendry (Stirling, Australia) and Elijah Taylor (Hawera, NZ). An established international test programme will eventually generate greater competition which will in turn lead to greater interest and ultimately new revenue streams not to mention international growth in the game. It should eventually lead to gains in the domestic competitions of each of the countries involved. Increased revenue will generate higher match payments but until that occurs the RLIF could set maximum allowances for match payments for players which would go part of the way towards levelling the field. If qualification for State of Origin is sorted out then this would also provide less of an incentive for players to declare themselves eligible for a super-strong Australia. As recently stated by Nigel Wood the global rugby league calendar needs attention now! Now is the time to strike while there is some post-World Cup momentum. The Cowboys. Kicked on after half time and made this one a rout. Warren Ryan. Listened to his call of the Roosters v Dragons game on Anzac Day and his insight on the game is fascinating. He hypothesised that the Roosters deliberately draw a penalty when their defensive line is vulnerable in a set, hence why their penalty counts are so high. I’ll be looking out for that one next time I watch them play. 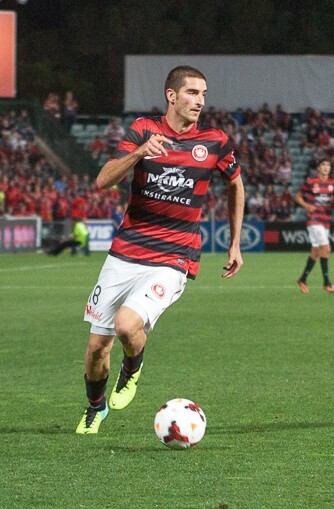 Western Sydney Wanderers vs Central Coast Mariners. That crowd was going bonkers for the whole game. I don’t know how they keep it going. The game itself was a classic. When the Wanderers went up 1-0 Central Coast threw everything at them and the Wanderers counter-attacked at every opportunity. Final score Western Sydney 2 Central Coast 0. Riveting stuff. The Newcastle Knights and the NRL for guaranteeing a lifetime salary for Alex McKinnon and planning a fundraising weekend to cover the myriad of medical costs he is incurring and will incur over the course of his lifetime. I thought that was classy. Racism. Donald Sterling, owner of the Los Angeles Clippers was banned for life, fined $2.5M and the NBA are investigating whether they can force him to sell his side as a result of racist comments attributed to him in a recently released recording. NSW Country selecting David Mead. He is the quintessential Kumul. He arrived in Australia age 12 after beginning life in PNG so only just qualifies under the new SOO criteria. He is the second Kumul to make himself unavailable for PNG for the next four years after James Segeyaro declared himself available for Queensland. The NSW wing position has now robbed international football of six wingers when you add Akuila Uate to the mix as well. Not good. The selection of the Kiwi team was a little puzzling. Some of the exclusions can be explained due to injury but many others who have been a part of the set up in recent seasons were omitted. The selectors have stated that it is a team based on form and with an eye to the future, however, earlier comments after the review the NZRL performed post-World Cup would seem to indicate that there might be more to it than that. I will watch the game but I will be surprised if it is anything but a one sided contest. One thing is for sure the Kiwis need to come out with a different strategy than the one they used in the World Cup Final. Was this round a return to the status quo? Tigers and Eels back to the pack? Parity is a wonderful thing. Daly Cherry-Evans – Run Metres – 77m, Tries – 0, Try Assists – 4, Tackle Breaks – 3, Tackles – 16, Offloads – 2, Line Breaks – 3, Line Break Assists – 2, Errors – 1, Penalties Conceded – 0 and Years waiting behind Cooper Cronk and Johnathon Thurston – 100. Greg Inglis – Run Metres – 204m, Tries – 1, Try Assists – 1, Tackle Breaks – 10, Tackles – 2, Offloads – 2, Line Breaks – 1, Line Break Assists – 2, Errors – 2, Penalties Conceded – 1 and Current players who could have scored that length of the field try – 0 (there’s only one GI). Representative games only this weekend so no tips. This entry was tagged A League, Australia, Basketball, Football, Greg Inglis, Kiwis, NBA, New Zealand, NRL, PNG, RLIF, Rugby League, Soccer. Bookmark the permalink.